After	taking	the	test,	highlight	the	learning	targets	that	you	will	need	to	focus	on	for	the	final	exam. Make	notes	as	to	how	you	would	study	these	targeted	sections. Unit	Target:	Describe	the	role	of	the	cardiovascular	system	in	linking	all	parts	of	the	body. -Why	is	a	blood	sample	considered	an	important	diagnostic	tool? -Define	“qualitative	test	“	and	“quantitative	test”. -What	does	the	word	“morphology”	mean? -Compare	a	total	WBC	count	to	a	differential	WBC	count. -Why	are	RBC	counts	taken? -Why	are	WBC	counts	taken? -What	do	blood	antigens	tell	us? Where	are	they	found? -What	are	antibodies? Where	are	they	found	in	the	blood? 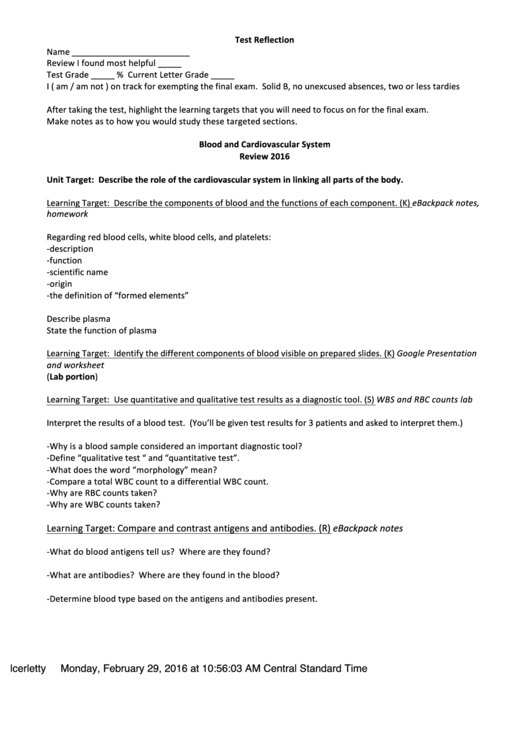 -Determine	blood	type	based	on	the	antigens	and	antibodies	present.